Today I’d like to welcome A.K. Benedict to my blog. She’s the author of Jonathan Dark, or The Evidence of Ghosts. A brief blurb before we get going, to whet your appetite. One of the many fantastic characters in the book is Marjorie, a cabbie who looks after the dead as well as the living. I asked the author if she would mind passing on a few questions to Marjorie, and she very kindly obliged. 1. Hi Marjorie. Who would you most like to pick up in your cab? Ooh now that’s a lovely question, and an even better thought. If you’re talking famous people, I wouldn’t mind Cary Grant. I’d have a good time with his ghost, I can tell you. I reckon I’d have a great night with Mae West. I’d get Diana Dors along – she’s a laugh. 2. Do ghosts get grumpy if you take a turn that leads to a dead end? Ghosts and the living are very much alike – they can all be grumpy bastards at times. It’s harder, mind, to sling a spectre out of the cab if they turn nasty. The only dead ends my cab encounters these days, mind, are those sat on its seats. Last time I took a wrong turn was in 1968 and Jim, another cabbie, spotted me. I didn’t live it down for years. Jim still brings it up on my deathday. 3. Where are the pickup ‘hotspots’? Round the Tower? Whitechapel? Posh types in Kensington – what about around the docks? Those are all good, but not because people died there. People die everywhere – those areas are great for ghost tourists. You don’t stop wanting to see the sights just because you’re dead. Cemeteries are real hotspots. It’s popular to go and watch relatives mourning at your graveside. A lot of truth comes out at gravesides. A lot of nonsense, too, but you’re more likely to get that apology you’re after. Train stations are also popular. Free travel is very attractive when you’ve had to pay for it all your life. They tend to go late morning or afternoons to get a seat. If you’re in a carriage with a lot of empty seats – then you’re probably not alone. 4. How long have you been taxiing ghosts around the city? Let me see now. I got my license in 1960 and started picking up ghosts almost from the start. I’ve been Sighted all my life so it seemed impolite to drive by when they flagged me down. So that’s fifty-six years or so. Blimey. At some point during that time I died and became a ghost myself. I saw no reason to stop driving a cab. I’ve never been the retiring kind. 5. Do all the ghosts realise that they *are* actually ghosts? heaven, or hell, or limbo. They’re not. This is it – only this time you don’t get a body. Not your one, anyway. 6. What’s the strangest fare you’ve ever had? The ghost of a gorilla walked out of London Zoo and hammered at my window. I let her in, she sat in the back and I took her on a round trip of the sights. She seemed to like Buckingham Palace – she thumped on the seat. Could’ve been a republican protest, I suppose. I dropped her back off at feeding time and she put a hand up to the glass before walking back into the zoo. Everybody needs a day out sometimes. 7. Are ghosts good tippers? How do ghosts actually pay, anyway? Some ghosts are great tippers, others not. Some haven’t had a chance to build up reserves of obols yet – obols are ghost currency, in Europe anyway. Have been since ancient Greek days. It’s not quite the international money markets, though. The coins are solid in living hands, insubstantial for ghosts so that they can handle them easily. Some materials are like that, such as thinsilk. Ghosts carry their obols in thinsilk bags or purses. 8. Has anyone ever tried to get in the cab if they could not see there was already a ghost riding inside? The orange sign keeps most of them away – they see that it’s not on and assume I’m off duty or on my way to somewhere in particular. It happens occasionally, though, especially when I stop in the traffic. I usually remember to lock the door but sometimes I forget. One afternoon, a city boy barged in while I was taking a grieving ghost to a funeral. Lovely lady, she was, gentle. I was about to have a word when the lady turned to him and screamed in his face. He left pretty quickly after that. Thanks Marjorie! 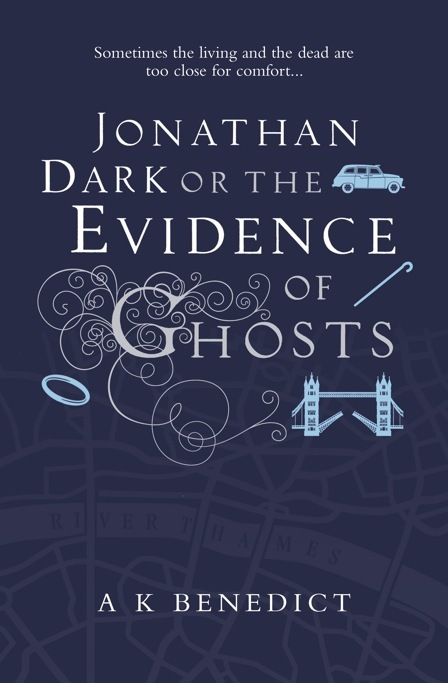 Jonathan Dark or The Evidence Of Ghosts by A. K. Benedict is available from 25th February, published by Orion. Enormous thanks must go to A. K. Benedict for being such a good sport and playing along! Thanks also to Netgalley for the review copy – watch out for a review soon!